Delhi is one of the most fascinating places in the world,weather wise. It’s deathly hot in the summer, and its winters are frighteningly cold. On one such winter morning in Delhi, on my way to college in an auto I experienced something I had never experienced before. I was at a stop sign, and a young girl with dirty brown hair, and big curious brown eyes walked up to me. It was not that I hadn’t seen girls like her before, or that it was the first time someone had come up to me in an auto and asked me for money, but this time it was different. It’s almost as though the numbness of my fingers reached my heart, and I was able to feel just how numb it had become. For years now, I have been coming to India for vacation and staying with extended relatives. They all seem to have one common mantra from Delhi to Bangalore “don’t look at their faces.” 'Their', in this case, referring to the beggars on the street. I never questioned this because I wanted to avoid the awkward situation of staring at a complete stranger, and them staring back. But this morning was different; I looked into this young girl’s eyes, and looked past her smile. I saw her parents on the sidewalk, or at least what they call a sidewalk in Delhi, and saw them covered in torn blankets, and rotting clothes. I saw their health and spirit deteriorating, and me not being able to do anything about it. When I saw this, it was like all of a sudden my problems had no place in the world. I didn’t have the right to complain about the cold because I am fortunate enough to run the heater the whole night, and afford blankets that make me sweat so much that I have to pull it off at times. What seem like little, or insignificant things are actually the most important in life. And if one wants to discover that, India is the place to come to. The disparity between the rich and the poor is just horrific, and it’s probably the only place on earth where the richest of the rich and the poorest of the poor can live on the same street, side by side. I graduated in 2005 from Westview High School in San Diego. Though I didn’t live my whole life in San Diego, I spent some of my best years there. People always said that high school years would be some of the most fun years of life, and my high school years truly did not disappoint. From trying my hand at cheer-leading, to being extremely active in Student Government and high school politics, I tried to do anything and everything I had time for. High school was my home away from home. I loved those early mornings when I’d go to Starbucks and pick up a grande vanilla late, and sometimes that delicious 20-grams-of-fat brownie, and head over to school to start decorating and preparing for the pep rally. After my graduation ceremony my parents decided to move to India. Actually the thought of moving to India was just devastating. Here we were in this beautiful suburban town, a ten minute drive away from the beach; there was nothing to complain about. But like many Americans, my father was out of a job, partly in fact due to the outsourcing phenomena that really kicked off after September 11, 2001. It was a conundrum. Witnessing my own father struggle to breathe, watching his demeanor slowly fade away, or move to India a place where he could live a very comfortable life and more importantly, enjoy it. He chose to move to India, and I came to terms with it. I knew that the bathrooms had become better, and that you could buy peanut butter in the local grocery shops, so I had very little to complain about. Initially, as in the case of any move, it was overwhelming. To see the people staring, trying to figure out where you’ve come from, and what your life story is. To have maids in the house that you’d greet nicely in the morning, but still sneak away from for a minute just to make sure all the cupboards are locked and that all the valuables are kept away. I don’t know, it was all very confusing, but what it came down to was dealing with people. People are so vastly different, that it’s simply amazing. People in India are different too, and in order to make life easier all around, it’s best to just accept it, and adjust yourself to be able to deal with it- because you can’t change them. My mom still has road rage, a very unhealthy degree of road rage, even after two years of driving. I tell her that the only person she is harming is herself, because her blood boils. The cycle ‘wala’ could care less; it’s just part of his everyday life- they are daredevils. The ‘chalta hai’ attitude in India is one commonality from the North to the South. It is only after realizing this that I truly came to peace with living in India. One of my mom’s friends once said that “to survive in India you need two things: patience and a good sense of humor.” It really is a lot of fun to India when you can make fun and just laugh at it all. The next time you go to Janpath, or Cosway, or Commercial Street and the smiley shop owner “uncle ji” does the Indian bobble head thing while saying “250 Rupees only Madam- only 5 dollars!” Just laugh a little, and say “Ok no thank you uncle!” with the same bobble, it’s the most rewarding experience you can have. Better yet, when people on the street stare at you stare right back at them and make funny faces just like you used to when you were a kid. Seeing their expressions afterwards is priceless. People at my college always ask me “why did you come back.” Before, I had no answer. I used to think to myself “Man, why did I come back?” Everyone here is trying to get out, so why did I come back- it was almost like instead of progressing I was in the process of regression. After thinking long and hard about this, and really contemplating my reasoning for coming back, the answer I give them is “why not?” The economy and opportunity here is just unparalleled compared to anywhere else in the world. India is a vibrant place, just as vibrant and colorful as the beautiful saris worn by the beautiful women here. India has so much to offer because while it’s modernizing in many ways, the culture is being carried along it. The ‘new money’ kids are shopping at Chanel, and Versace, at the same time they’re also shopping at Manish Malhotra and wearing those beautiful clothes to celebrate festivals like Diwali and Karva Chauth. The rich culture and history that has woven together the popular ‘tourist’ India, is now becoming more common amongst local Indians. They are embracing all the things that they have otherwise taken for granted. Initially I was hesitant about my move to India, but a year and a half into the experience, I love it. Sure I miss my bagel and cream cheese, but living life in India has made me open up eyes to the world beyond the world that I’ve lived in, in America. These years of my life will be cherished probably more than my high school years just because I’ve really been able to gain an understanding of life, and the vivacious people that live in it. 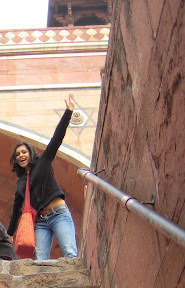 Isheeta Sanghi was born and raised in the United States, but moved to India a few years ago. She is currently attending a private university in Delhi. This entry was posted in Culture Shock! on February 24, 2008 by vpdot. Came across your article while doing a ‘is moving back to india hard for NRIs’ search (lame? Perhaps but gives you a indication of how petrified I am of the move!) Tell me is it really difficult? My biggest fear is that of rejection – I dont go back on holiday but whenever I have I sensed that the locals including my relatives treat me differently like an outsider and a traitor for having left them behind.. Most importantly my fear is of not being employable..I am a women’s issues community worker and I fear my lack on knowledge in reading/writting hindi will work against my favor in that respect. I to want to move back to India. I was born and raised in India. My parents moved to CA when I was young. I had a tough time integrating with kids of my age in high school. But when I reached university I got use to the culture and living and my accent improved to 100% American. Up until I got of university and was married I had no thoughts of moving back. I’m not sure what happened over the years. I slowly became resentful of the western culture and living and started to miss my people, my culture and my nation. I saw how south Asians moving here had no shame in losing touch with their culture. Knowing their parent’s language is not important for kids who are born and brought here and it bugs me. You talk to them in hindi/punjabi and they respond back in English. I even saw my cousins who migrated at same time as me adopt English at home with their parents and among siblings right after moving. I’m an entrepreneur and I’m doing good financially. But even with all the money, I feel I’m not happy. I’m a conservative spender and I don’t believe in materialistic possessions. My parents came here so I could get a better education, which I did. My wife was born here and she is not interested in moving to India. I feel stuck! As you get older by age you will love to go home .. Start looking for good Apartment so you can start spending time there. I been here 30 year and I was like you and Now I cannot stay . you should start visiting twice a year than 3 time and than 2 month and than move . Although it has only been four and a half years since I’ve been in California it turns out that I’m slowly beginning to resent living here! Thus I’m considering moving back to India. Isheeta, I love your blog. Reading it gives me courage and reason to look forward to a respectful life , back in my Home Land, India. I came to Chicago, post 9/11, been living here for 10 yrs, and can’t tell you how many times, I have been told I am responsible for the lack of jobs in this country. Who says profiling ,racism and hatred doesn’t exist ? Being born and raise in india and just being in US for 5 years now, i still feel that uncertainity and scared to move back. After reading your thoughts, i realised i was so weak and lack of determination. I am from gujarat, and all the friends back home are trying to escape from there. I feel stupid or confused that i want to move back, after observing what they want. I think it depends on person but also at times, one has to experience to realize. I am getting clearer of what i want , just need to be stronger now. I am feeling hopefully seeing i am not the only one going through this. A human mind is full of infinite potential, don’t let it set to certain comfort zones. Always be ready to changes. I been here from 30 year and my parents went home at Baroda . My father is very old and has cancer and I got phone call and went there . What I saw was all the friends(neighbor) around him and supporting him and my mother . Here my neighbor do not my full name . I also change my idea and I think it best to return home . Isheeta, well written article.. Though must say to live in India one needs the money , a (financial stability for a comfortable life) a good job and the will to see the move through. Being at a high position the switch maybe easy but what about people who have everything overseas but move only for say kids education, or to be close to family? It’s like starting all over again in an alien setting! New job new life n no guarantees for creature comforts as what ones used to.. It’s a big decision n guess one based in ones priorities, something not everyone is lucky not to regret.